While writing her forthcoming cookbook, The Banh Mi Handbook (July 2014), California-based author Andrea Nguyen went on a mission to create the perfect bread recipe for the Vietnamese sandwiches. She wanted it to be crispy but not too crusty on the outside, and light and airy within. 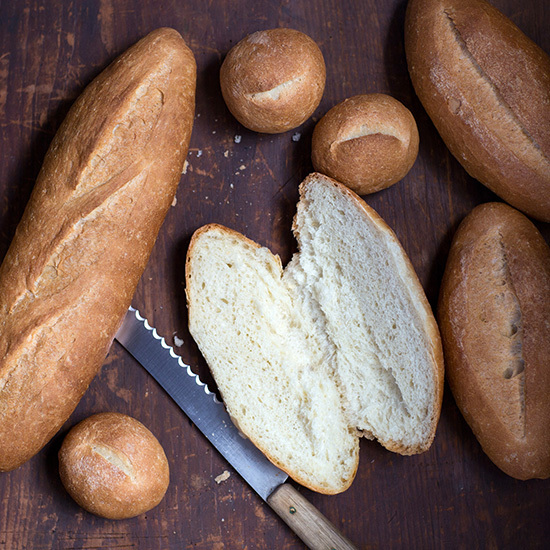 “You don’t want that fancy bread that has a long ferment,” she says. “That will tear up the roof of your mouth.” What she learned along the way: It’s actually very hard to master lowbrow white bread. Here, she explains the process behind creating a perfect recipe. 3. Expand the search. “I realized that banh mi rolls are a bit like the Mexican bolillo rolls. Cookbook author Kate Leahy started doing some research and learned that in Mexico, there’s something called mejorante para pan—bread improver—sold at most markets. I went to some local Mexican markets and I couldn’t find it. “When I was down in East L.A., where there is a strong Mexican American community, I stopped in a market where they had the bolillo rolls. I mustered up all of my junior high and high school Spanish and asked if they sold the mejorante para pan. ‘What?’ the cashier replied, in perfect English. “I’m looking for this stuff that makes bread dough rise,” I told her, while pointing to the rolls. The cashier led me to the back, to the older woman in a closet-size office. She didn’t know what I was talking about. She dragged out the baker. He didn’t use anything in his bread but flour, yeast and maseca, the corn flour. Nguyen will reveal the final bread recipe in her book, The Banh Mi Handbook: Recipes for Crazy-Delicious Vietnamese Sandwiches, out from Ten Speed Press in July 2014. Kristin Donnelly is a former Food & Wine editor and co-founder of Stewart & Claire, an all-natural line of lip balms made in Brooklyn.